Xseed have posted this image on twitter, alongside their announced 2018 lineup, there are three silhouettes for unknown titles. Xseed has done similar teases for their upcoming titles in the past. The far right image is Senran Kagura Burst Renewal, as found by banballow on the Xseed forums. As far as I know the other two haven't been solved yet. The middle image is English Detective Mysteria as found by Saphirax. The final image is Ys Memories of Celceta, so presumably a PC port, as found by Dio Over Heaven. They should match up exactly to official artworks, and I'm pretty sure neither of them are Trails to Zero or Cold Steel 3 :P or at least none of the art I've tried matches up. I love this game! No idea what the games they are teasing are though, but I'm sure people here will figure it out. They all look like zero and ao no kiseki to me. Wow, sure does look like it. Wouldn't Atlus do that since it's a Sega property though? But no, because it's a Shining game. Yakuza and Valkyria might be firmly back to being localized, but we're about two decades behind on Shining localizations. I think you got it. Seems like the type of thing they would publish, too. There goes my interest. It's probably another crappy animu game. Seems like a risky thing to publish. They were actually working on bringing the psp version of that game over but had to cancel it due to some issues. 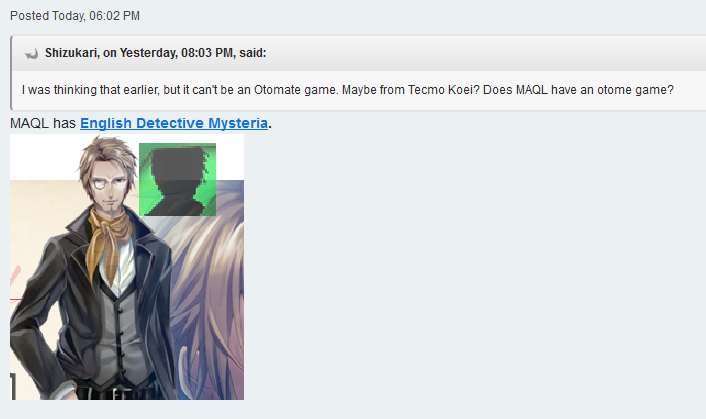 They also hinted that they’d be bringing over an otome game. That's awfully dismissive for someone who's primary interest is in two "animu" games. Isn't the Doyle estate pretty litigious when it comes to using Holmes? At least that's why people keep saying DGS wasn't localized. Yep, now the only question remains if they’ll just port the game to Steam. With how well otome has been doing for other companies, it’d be silly to skip the Vita port. Don’t think it had anything to do with Holmes. Even if it did, it’d be easily remedied by altering his name slightly. Other games did that. They've been doing Vita as long as another version like PS4 is made too. I would guess maybe Vita+Steam. Wow, good job! That was a tough one. It would be disappointing if we don’t get Cold Steel 3 next year. Cold Steel 3 already came out in Japan and having it be a 2019 game would be unfortunate. It's only certain stories that aren't in the public domain iirc. Problem with EDM is that the original was published by Marvelous, while the Vita port wasn’t. Falcom Meeting is this month isnt? Maybe the localization of CS3 announcement there? Oh, huh, they’re finally bringing over some otoge? Good to see. How so? Vita otome games have apparently sold very well for Aksys. Yes, unless they are having some licensing competition (please we won't need another embarassing Ys VIII scenario) i do think Kiseki is the saga that benefits Xseed the most, or at least the saga with more vocal fans. EDM makes a lot of sense. It wouldn't surprise me if XSEED's been sitting on a complete translation for so long and just couldn't find time to work on it after the Doyle case closed. This really seems like the game Brittany @ XSEED says she's working on, especially if said game has someone with a funky accent like one she tweeted about. I really wonder if Grand Knight History isn't out of the question at this point. Yeah, EDM definitely sounds like Hatsuu’s mystery project. I’m honestly not expecting anything Kiseki, as the most realistic Trails announcements we could hope for are Sen 3 or the PS4 ports of 1 and 2. It seems a bit early for either of these. EDM wouldn't be Uppers, but I'd sure love it. Actually it'd likely be dub only, wouldn't it? In which case - yikes, no thanks. Not for a VN. 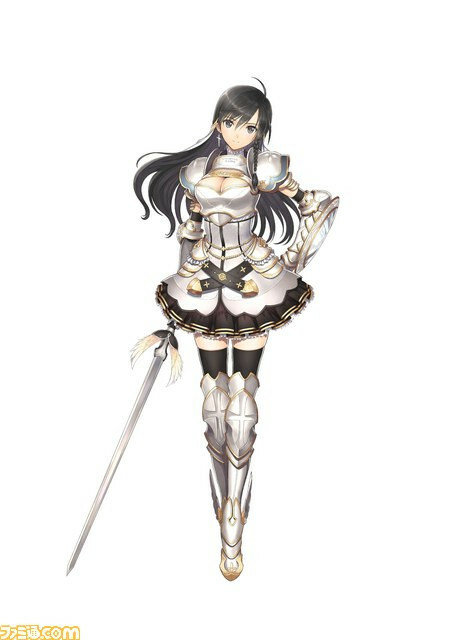 Senran Kagura was a given, cause XSEED. Although not really excited for it given that from what has been seen it's essentially Estival Versus in different environments. EDM sounds like a fun game, unfortunately otomes aren't my cup of tea. I honestly can't think of anything with wings in recent years so I'm going to guess it's an oldie, Touhou perhaps. Either way, not really that interested in anything but given what's coming out lately I can imagine XSEED's pickings are slim. Nice work. Was bothering me for a while. OMG yes please shower me with otoge. Oh, gosh, I didn’t think about that. I’m fine with English language VA in OELVNs, but here... Not going to be very appealing. They would need to get the rights, make a PC version (I don't think they ever made a console version by themselves yet) and put some money towards online features... It won't happen. I think it's specifically six or so of the last stories that are not in public domain everywhere. As long as you don't reference those, you're golden. While I'm sure a PC port would be on the cards and that's fine, I suspect you're right and they'll skip the Vita version of this which would be an absolute bummer if true. Especially since the otome market seems to be thriving there (plus it's my favourite place to play VN's atm). OT: Anyone got the third teaser yet? XSEED has Japanese voices in some games, (some don't even have dubs like Corpse Party, Senran Kagura etc.) and I can't see them paying for a full dub of a VN which likely won't sell very well in the first place. Okay, so which one of these is a Brandish PSP PC port? I'm always down for a new Senran Kagura game. I think there is so much concern in the Western Kiseki community over who will get to do CS3 that it would behoove XSeed to make the announcement as early as possible even if they aren't ready to announce a launch timeframe. Is Burst Renewal the Senran Kagura remake? That image on the left reminds me of Remilia from Touhou, but it's probably something else. I don't expect CSIII announcement until Hatsuu is done with her mystery project, but I'm guessing they'll bring over the PS4 versions of CSI and II after it's released in Japan. Burst was a great game with great characters and a nice plot. I'll definitely buy renewal.